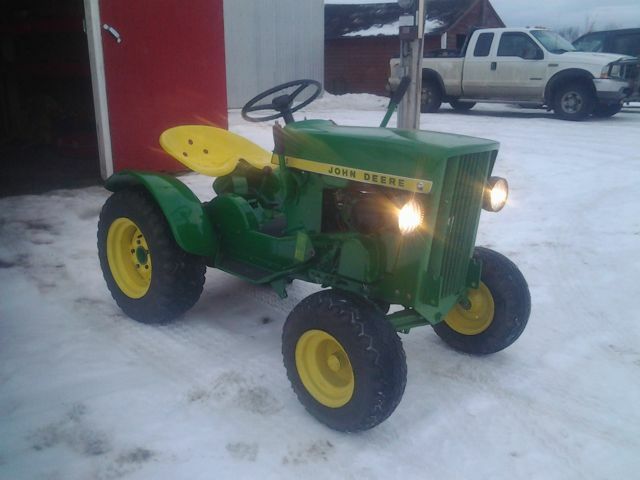 This entry was posted in Ernie and tagged Ernie, John Deere 110. Bookmark the permalink. I found your blog and have enjoyed skimming through it! 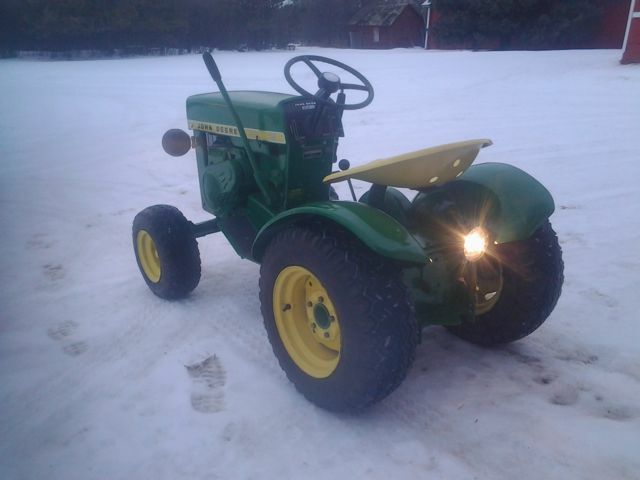 My hubby and I have bought 2 acres and were looking for a little tractor, mower, tiller and snowblower…and theres an ad up right now for a little JD110, for all of the above for what *seems* to be a good price! Since were debating buying it, I was curious to ask – are these relatively easy to find parts for, or are they more of a machine-it-yourself kind of deal? We are relatively handy people, but we also have ALOT of other hobbies, so debating if we want to purchase. Ever since first sight of the round fender tractors, they got my attention. Small, very solidly built, nostalgic. After seeing one, I found that I always watched for one as I drove where ever I went. Eventually, I felt almost possessed by my fixation. One day while browsing Craigslist, I found a 64/110 RF for sale in Oregon. I contacted the seller and we exchanged contact info. I called him right up! We talked about what he had for sale, and my serious interest to buy it. I live in Washington. The drive would be full day trip. My wanting a round fender, out-weighed sense. I wanted to have one. The seller’s asking price, made me want it more so. 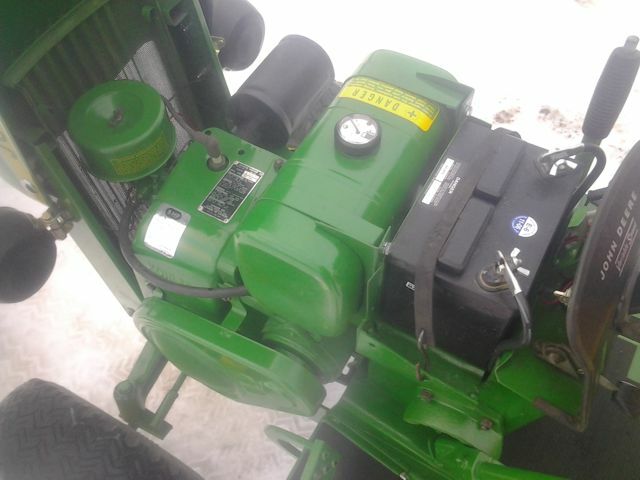 The tractor was complete and original so I was told, and come with a mowing deck with all the original bits to mount it. The little RF had a good life, that looked to been taken care of over the years. Not many signs of rust. Surface rust mainly at metal-to-metal pivot points. I made the trip to Oregon to pick it up. Along the way I stopped by a metal scrap yard that I heard had some old JD tractors. Once there, I learned that what I was interested in, a JD140H3, had been sent to the crusher, still advertised for sale. I’d planned on buying the 140 for a parts machine. I was a bit let down to find out it had been crushed. The guys at the yard took me to where the tractor was sitting to look around at other tractors that were there. The guys said look around, if you find something, come get us. After a bit of digging, I found a pair of rear, and a pair of front, JD, cast wheel weights. I went to the office and inquired on price. One of them followed me back to the area of the tractors, to see what I’d found. He told me to “take them”. No charge, since the 140 I’d come for was not there. I shook his hand and said “thank you”, as I drove away smiling. I made it to my destination of the 110. The seller took me out to his shop. Hey, there’s a 110 round fender. Smiling ear to ear. He cranked it over, and she come to life without fuss. She ran well. No smoke. He went on a little ride to show me everything worked. The mowing deck was on the floor in the shop. It too was in real good shape. The seller and I talked tractor for a bit, then loaded it up on the trailer for the long journey back home. It’s in really good shape. I’ve since bought an original muffler, and replaced the coil. I also bought a rear light, and found a pair of headlight brackets. I hope to some day find the actual headlights to make it’s night vision more obvious. I haven’t done much to it since I got it home. I do keep the battery charged for an occasional starting/running around my property. The little RF has a dry place in my shop….for now. Thanks for your great story! Always good to hear about another one of these little beauties finding a good home!